Text Indexing (text mining element introduced in PMML 4.2): derive a frequency-based value for a given term (not covered in this primer). Below we will see how these transformations can be used and combined to allow for data powerful pre-processing in PMML and the Zementis products: ADAPA for real-time scoring and UPPI for Big Data scoring. 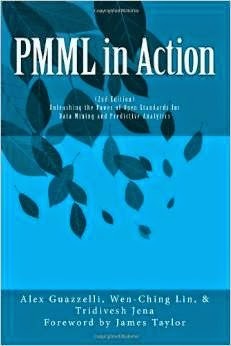 PMML transformations and much more are covered in the PMML book "PMML in Action" available on Amazon.com. Companion to the book and a learning tool for data pre-processing in PMML is the Transformations Generator, which is a graphical interface for learning PMML transformations. Transformations in PMML are also covered in depth in a PMML course being offered online by UCSD Extension. For more information about this course, please visit the UCSD Predictive Models with PMML page. This is a general method to normalize a continuous variable to another continuous variable. In the PMML code below, two normalizations take place and two derived variables are created. The first derived variable is named "DerivedNormalizedVar1" and the second "DerivedNormalizedVar2". The normalization itself is defined under the element NormContinuous. Typically, NormContinuous is used to normalize input values between 0 and 1 as shown in the first normalization example. However, as shown in the second normalization example, one can have as many LinearNorm elements as necessary and these do not need to normalized values between 0 and 1; the only restriction is that the first attribute orig must be in increasing order. The normalized variable is then a linearly interpolated value between the LinearNorm elements. Note that in the second example, we are using the attribute outliers to specify that any outliers to the normalization should be treated as extreme values. In this case, all "InputVar2" values lower than 100 will be assigned value "0" and all values greater than 900 will be assigned value "4". In this example, variable "CategoricalInputVar1" has three possible valid values: "Partner", "Associate", and "Colleague". By using the NormDiscrete element, we can create derived variables (the dummy variables in this case) that will be assigned values "1" or "0" depending on the value of the categorical input variable being processed. Note that we are also handling missing values in this example. The mapMissingTo attribute means that if the input value "CategoricalInputVar1" is missing then all three derived variables will be assigned "0". This method maps continuous values to discrete string values. For a continuous variable we define intervals and if the variable falls inside that interval, we assign to it the string value defined for that interval. In the PMML code below, the Discretize element defines the continuous field "InputVar" which is to be discretized. The DiscretizeBin elements define the intervals. The first one defines a bin which has a rightMargin of 1000. By default, its left margin (attribute leftMargin) is negative infinity. The closure attribute finally defines the interval as (-infinity,1000], i.e. the right margin is less than or equal to 1000. So if the value of the variable "InputVar" falls in this interval, we assign to the derived variable "DerivedVar" the string value “low”. Similarly, if the value of "InputVar" is in (1000,100000], the derived value is equal to "medium" and if it is in (100000,1000000), the derived value is equal to "high". One can establish what should happen if the input is not in any of the defined intervals. The attribute defaultValue in the Discretize element establishes that if the input does not lie in any of the intervals (as for example, if "InputVar"=2,000,000), then by default it is assigned the value "extreme". Discretization can also be paired up with element NormDiscrete to generate dummy variables which indicate if an input variable belongs to a certain interval. The PMML example shown below implements just that. We assume a numeric input variable named "InputVar" which leads to the creation of three dummy variables: "DerivedVar1", "DerivedVar2", and "DerivedVar3". These are used to indicate membership of "InputVar" to one of the following intervals: (-infinity,100], (100,200], and (200,+infinity). In the PMML code below, the attribute outputColumn in element MapValues establishes that the mapped output value will be found in the column named "color". The element FieldColumnPair uses the attribute field to define the input for mapping which consists of one or more input variables. In this example, we use two variables "InputVar1" and "InputVar2". We find the input value in the "animal" column for "InputVar1" and the input value in the "property" column for "InputVar2" and map them to the output value in the"color" column. The InlineTable element finally defines the table to be used for value mapping. So for example, if variable "InputVar1" has the value "dog" and variable "InputVar2" has the value "smart", we find "dog" in column "animal" and "smart" in column "property", both in the first row. These are them mapped to the value in the column named "color" in the same row. In this way, derived field "DerivedVar" is assigned the value "red". Note that in the example shown above we are mapping missing values to value"2" and setting the default value to "1" inside the MapValues transformation element. Derived field "GroupedInputColor" is assigned the result of the mapping between the input strings and the number representing the group. This variable is then used to generate the desired output. If "GroupedInputColor" contains value "1", variable "VarColorGroup_1" is assigned value "1", otherwise it is assigned value "0". If "GroupedInputColor" contains value "2", variable "VarColorGroup_2" is assigned value "1", otherwise it is assigned value "0". This is accomplished by the use of the NormDiscrete element as described earlier. Note that we are mapping missing values to value "4" and setting the default value to "3" inside the MapValues transformation element. Derived field "GroupedInputColor" is assigned the result of the mapping between the input colors and the number representing the group they belong to. As before, variable "GroupedInputColor" is then used to generate the desired output through the use of the element NormDiscrete. The mapping table itself is only being referenced inside the element TableLocator. We are using a PMML extension in this case to indicate to ADAPA that the mapping table we want to access is named "GroupedInputColor". Note that functions such as "min", "max", "sum" and "avg" take a variable number of parameters (derived fields or input fields) and return a single value which can then be assigned to a new derived field. Please refer to the DMG website - Built-in Functions for code examples and descriptions. Note that it uses two different input variables: "InputVar1" and "InputVar2" as well as a number of numeric constants. The example shows many built-in functions which are used together to implement such a complex operation. The end result is assigned to derived variable "ResultVar". PMML also defines many functions that support boolean operations. These are used to compare parameters which are required to be of identical type (e.g., strings or dates) or of compatible type for numeric variables (e.g., double vs. integer). The result is of boolean type: "true" or "false", which is evaluated by functions such as "if" and "not". equal: evaluates to "true" if "a" is equal to "b", "false" otherwise. notEqual: evaluates to "true" if "a" is not equal to "b", "false" otherwise. lessThan: evaluates to "true" if "a" is less than "b", "false" otherwise. lessOrEqual: evaluates to "true" if "a" is less or equal to "b", "false" otherwise. greaterThan: evaluates to "true" if "a" is greater than "b", "false" otherwise. greaterOrEqual: evaluates to "true" if "a" is greater or equal to "b", "false" otherwise. isIn: evaluates to "true" if "a" is in "b", "false" otherwise. Attribute "b" in this case is an array of values. isNotIn: evaluates to "true" if "a" is not in "b", "false" otherwise. Attribute "b" in this case is an array of values. isMissing: evaluates to true if "a" is missing, i.e. equal to NULL, "false" otherwise. isNotMissing: evaluates to "true" if "a" is not missing, "false" otherwise. and: summarizes the results of two or more independent boolean operations. Evaluates to "true" only if all operations are "true", "false" otherwise. or: summarizes the results of two or more independent boolean operations. Evaluates to "true" if a single operation is "true", "false" only if all operations are "false". In this example, we are using "InputVar1" which contains a string to assign values to two very different derived variables: "DerivedVar1" which is a string and "DerivedVar2" which is an integer. Note that the code uses functions: "if", "equal", and "not" as well as the built-in fuction "*". The main reason for not using the "else" part of the "if" function is simply because we want to assign the "then" result to "DerivedVar1" and the "else" result to a different variable, "DerivedVar2". Data transformations in PMML are encapsulated under a single DerivedField element. DerivedVar1 = "5.1 * InputVar2"
DerivedVar1 = "InputVar2 / 3.3"
Note that in this case, "DerivedVar2" is not being used. The "then" and "else" part are being used to assign the same variable "DerivedVar1" the result of two different computations. We showed earlier how to use the Discretize element in conjunction with NormDiscrete to create dummy variables to indicate membership to numeric intervals. What if we would like to do just that, but this time for strings? The PMML code below exemplifies how this could be accomplished by using functions "if" and "lessOrEqual" in conjunction with the NormDiscrete element. IF InputVar less or equal to "Denmark"
IF InputVar less or equal to "France"
Note that the three dummy variables: "DerivedVar1", "DerivedVar2", and "DerivedVar3" are used to indicate the membership of input variable "InputVar" to three different string intervals. When defining a PMML document, the pre-processing of the input variables is mainly located inside the following PMML elements: TransformationDictionary and LocalTransformations. Although the TransformationDictionary element is mostly used for user-defined functions (element DefineFunction). I just want computers to make sense! I am curious, and feeling bit rebel. Why XML, why any specific data defining flat file schema and markup. We have progressed so far, and still working with boundaries of any markup?? Sorry, for bit rebellious on your post, which is definitely a stepping stone for many others to come, so, my my comment may do some reach. 1) Why We are with in language barriers, in computer science. This post is in English, Markup and definition is in English. Brackets which are used are from english. 2) Why not diagrams ? Why not some circutry.. plain vannila.. photographs. Will that will not make everyone happy ? 3) Why XML ? another debate, and why markup ? Why not JSON/YAML/TOML/Binary or any other format.. as thing should be predictive. Right. XML just because of DTD or XSD being predictive which is another markup..
4) I want my friends, who are mathematicians, for them, to do their job best with out learning a new language, they can use their own universal language which is numbers. Isn't computer language / markup or this innovation comes from mathematics.. and who say mathematics can't be diagrammatic.. I am totally aware, people or moderator who are going to be very furious, after reading this. But guys, may be wrong place, but you can help us out to reach right message with right peoples.